What is the Bee Gym?? 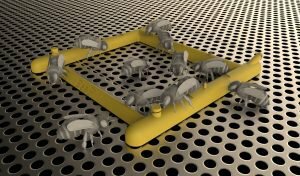 It is the world's first grooming assistance device that helps the bees to rid themselves of varroa mites. 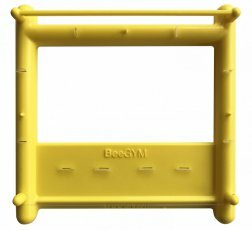 The Bee Gym is a framework of wires which will enable the bee to scrape varroa mites off their backs, together with flippers and scrappers to help the bees remove the mites from their abdomen. Any dislodged or damaged mites will fall to the bottom of the hive so an open mesh floor should be used and emptied regularly. 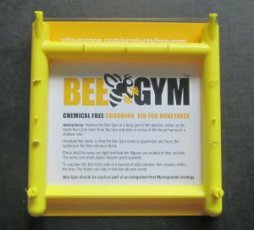 The Bee Gym is a physical grooming aid and is chemical free. It can be left in the hive all year - save for an annual cleaning! The Bee Gym should be positioned in a busy part of the colony, about 2 cms back from the hive entrance or on top of the brood frame. Use along with a sticky board to observe mite drop.